every first and second Friday of the month. Next parties: Friday, April 12th, May 3rd & 10th. Class at 8:00pm, social from 9:00pm – 11:00pm. $10/person for the class, $10/person for the social, or just $15 to attend both the group class and the party! 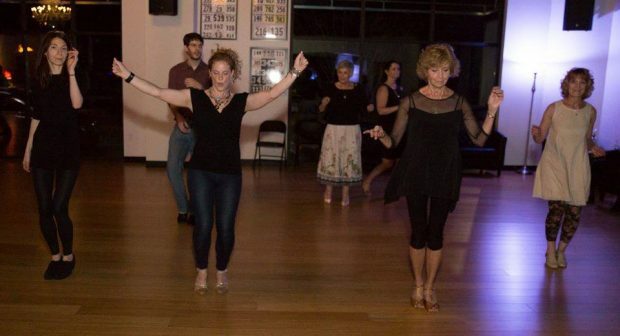 Friday night All Levels Group Class at 8:00pm, followed by a Social Dance Party, will occur EVERY FIRST AND SECOND Friday of the Month. This is open to the public and you do not have to be a student at the studio. No partner necessary, no experience necessary. Practice your moves, learn some new ones, enjoy great company! Live DJ plays a variety of music from Waltz to Swing to Tango, Line Dances, Cha Cha, Salsa, Merengue, you name it. Always a blast and great crowd of people. $15 for class + party.